You will be astonished at how easy it is to cook your favorite dishes in a Crock Pot. 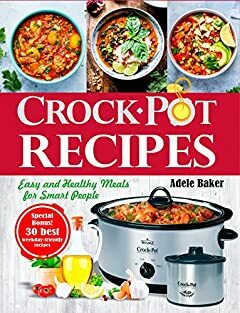 This Crock Pot Cookbook is filled with nutritious and delicious recipes. The first thing you need to know: You can cook everything you want in a Crock Pot. The second one : Only high-quality recipes will reveal the whole aroma and taste of dishes cooked in a Crock Pot. And the last one: With this cookbook, you will cook better, tastier and faster meals for yourself and your family. Tasty options for breakfasts, main and side dishes, snacks, and even desserts – fantastic meals everyone will love and desire with a minimum of cleanup.